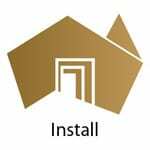 We are a South Australian solar energy system designer and installer company for commercial and domestic clients throughout SA. We have been involved in the solar industry since 1997. Our prices include everything from supply, installation and commissioning to dealing with the administration, approvals and meter booking process – there are no ‘hidden extras’ from us! We supply all major ‘Clean Energy Council Approved’ makes of panels and inverters and our installers are licenced and CEC approved electricians with over 10 years of experience in the solar industry. We love everything about solar energy and look forward to meeting to discuss your individual requirements. Contact us today for a no-obligation free property assessment and quote. Whenever the sun shines (and even in overcast weather) the solar cells generate electricity. 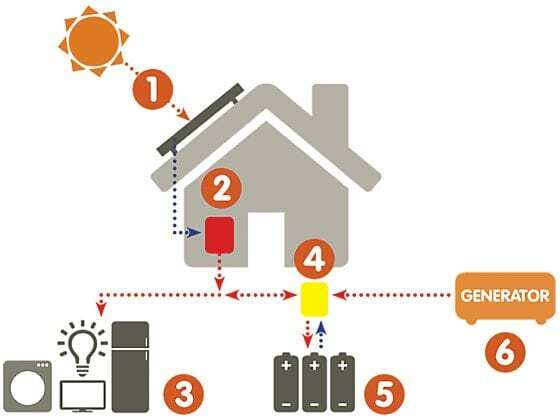 While the technology behind solar energy may seem complex, when broken down, how solar power works is easy to understand – particularly in a grid connect scenario as it only requires a few components installed in your home. With electricity prices constantly rising, more and more households are making the switch to energy saving alternatives, such as solar PV systems and energy saving lighting. As electricity prices continue to increase and solar power becomes less expensive, it is a very good time to go solar. The sun’s energy is free, clean and abundant here in sunny South Australia, allowing you to enjoy considerable savings on your electricity bills. Adding a solar system to your home or business is a sound investment, it reduces your electricity bills and adds value to your home or premises! Once you’ve made the choice to go solar, you’ll be delighted at how simple the process is. Using up-to-date satellite images, we can custom design your Solar system and provide you with a no obligation quote. If you prefer to speak to someone face-to-face who will explain the process and pricing in plain English, we will come to your home and business and do just that – no charge – no obligation! Once you’ve decided to embrace solar, we’ll take it from there – no form filling or applying for approvals – we do it all including the application process for your new solar meter with your electricity supplier! The 240V AC electricity is used to power appliances in your premises. Surplus electricity not being used is fed back into the main grid. Electricity companies will meter the electricity you feed into the grid and provide you a credit for it. Greenbuild Energy Solutions installed our off grid solar system and I am so thrilled that we were lucky enough to find them and have them design and install the system. Lyndsay and Jason know their stuff when it comes to solar, we got honest and reliable advice when it came to deciding which system to go for, we got service that is second to none and we now have a complete off grid system that works seamlessly. I am so thankful to both Lyndsay and Jason for the wonderful job they have done for us and would highly recommend them to anybody looking to install a solar system to their property. I’m very happy to had my 5 kW solar system installed by Greenbuild Energy Solutions. The installation process went smoothly, all questions answered quickly, paperwork well provided. Definitely would recommend to friends who want to install solar system. We chose greenbuild energy because they were local and there customer service was amazing. Our salesman Paul was honest, informative and professional… he was able to accommodate our every need.. throughout the process lyndsay was the to answer all our questions and concerns. The installation team Kenny, Tom and Thomas were very professional and informative throughout the install. I would definitely recommend this company. I had researched many solar companies in Adelaide and found Greenbuild Energy Solutions to be the best buy far. Friendly no pressure quote. Install was prompt & on time as promised. We received a number of quotes for exactly the same panels and inverter. Greenbuild are a local company, the installation was quick, and they were the cheapest. We were asking about battery installation in addition to panels and after going through our energy usage he pointed out that the cost savings would not justify the install price. Paul came to our house and explained all of the different aspects of the products available and the where the best value for money would be for our situation. Greenbuild Energy Solutions Ltd offer solar deals and are really good at explaining the pros and cons of every type of solar system i will be going back to them down the track to install some battery storage. This was a painless experience. Greenbuild handled all the paperwork & their installation of the solar system was organised seamlessly. The fact that Paul (salesman) called to advise the rebate had gone up and the price of the system was now much lower than first quoted. He didn’t have to do that, company could have pocketed the saving, great ethical value! No one else did this. Very happy with installers, knew exactly what each had to do and just did it, very professional. 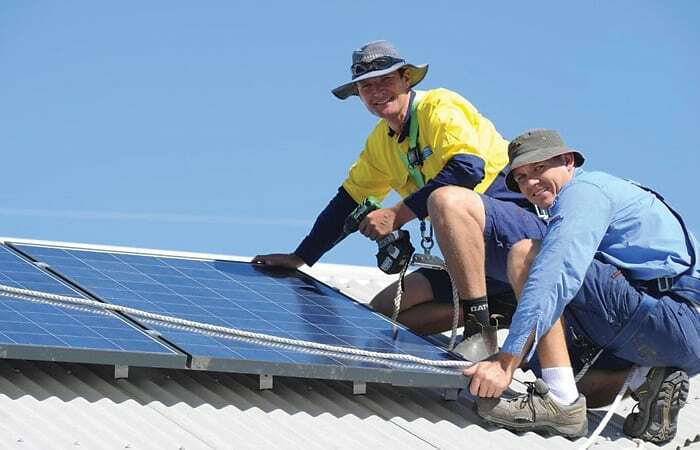 Many South Australians have benefit from solar on their home. The benefits listed below indicate just a few reasons why you should consider it for your home. Regardless of the reasons why, you and the planet are the winners with renewable energy. We don’t think we’ve met a person yet that regretted installing solar – but have met plenty of people regret not getting it sooner! Our on-site visits allow us to assess your property for the most suitable system, consider and overcome issues if they exist, and discuss with you what you want the system to achieve for you. Here are some of our most popular solar packages for your home. The top 30 panel brands world wide are referred to as Tier 1 products, so if you are offered any of the following solar panels, you are getting tried and tested panels from the top 2% of solar panel manufacturers. Tier 1 is a great place to start when deciding on what panel to choose – the following panel brands are all tier 1. Q.Cells, Canadian, LG, Jinko, Trina, Longi, Sunpower, REC, Risen, Winaico, Talesun, BYD, Eging, ET, HT-SAAE, JA and Seraphim. There are reviews on our favorites further down this page. The most popular panels, because cheaper to manufacture, are made up of 60 blue coloured cells, and are called, polycrystalline modules, or poly panels. Most manufacturers make a range of poly panels, and apart from minor differences in the frame size and quality, there really isn’t much at all to differentiate one from another. The standard wattage of most 60 cell poly panels today is between 265-285W. Are black in colour . Monocrystalline solar panels have high efficiency rates and are space-efficient. Since these solar panels yield the highest power outputs, they also require the least amount of space compared to poly panels, 60 cell monos are physically the same size as polys, but where a 60 cell poly would be a 275W panel a 60 cell mono would be 300W upto 360W so a good option on tight roof spaces. Monocrystalline panels tend to perform better than similarly rated polycrystalline solar panels at low-light conditions. All producty warranty is directly with the Original Equipment Manufacturer (OEM) for your complete protection and peace of mind which means that is the solar company that you bought your system through goes out of business – you are still covered by warranty. We like to deal with brands that have an Australian based office and the following do: Canadian Solar, Jinko, Trina, Q.Cells, and LG. Canadian Solar did indeed start in North America many years ago, but are entirely Chinese run. They still make a reasonably small percentage of their panels in North America, but what we get here is all out of China. Not that we care about that. Same robots, same result, no matter where it’s made – a great panel. It is very likely that Jinko Solar is the world’s largest manufacturer of solar panel manufacturers. While Trina Solar led the world in production in 2015, in 2016 Jinko appeared to take the lead and their solar panel production for 2017 was from 8.5 to 9 7 gigawatts. That is around 8 times as much as the whole of Australia installed in that year. We love Jinko and it’s what I have on my own roof! Trina, JA and Seraphim are also top brands and don’t make any pretence in their names to be anything other than what they are…Chinese and proud of it. Longi Solar Longi only makes monosilicon and is the world’s largest producer. They are members of the “Silicon Module Super League”; which is the group of now 7 companies that account for around half the world’s solar panel production. To date, most of Longi’s production has been used in China, but the firm has been expanding into overseas markets and their panels are becoming more common in Australia. Great panel and comes in a 290W and 300W version for not much more than a regular panel. Hanwha Q CELLS produces panels in Malaysia, China, and Korea. They used to have a production line in Germany, but they shipped the plant equipment to Malaysia in 2012. An above average product warranty with a competitive price makes Hanwha Q Cells a good choice and I have no problem at all in recommending them. LG. We all know this South Korean giant. Great panels, great solar batteries. The LG NeonR panels are genuinely a bit better in the heat, and a bit better in shade than regular panels and as a result we see them consistently making 3% and sometimes as much as 5% more power than other panel brands. But you certainly don’t pay the huge extra price for a few kWhs a year of power. You pay for the fact that you get 330W per panel instead of 275W and an awesome warranty, but really, the investment is in roof space. You only need 18 of these panels for 6.6kW compared to 23 or 24 of a regular panel, but if you think that means they will work out cheaper, think again! The quality of solar inverters today is hugely improved from a few years back. A simple relay was the undoing of a huge number of inverter brands, dragging down their wholesalers and retailers with them. What we are left with today is really very good, across all price points. We would have no hesitation in recommending and honouring the warranty on today’s lower cost inverters from Growatt, Goodwe, Zeversolar and Sungrow. We install them day in day out and if there is a warranty issue, it is easily dealt with. We would be happier, and in the long run, so will you, if you bought Fronius or SMA but it will cost you about $800 to $1200 more than one of the standard models. Fronius make excellent ‘string inverters’. Primo range for single phase, and Symo range for three phase. All 100% European made (Austria), 10 year parts and 5 year labour warranty. Excellent reporting via inbuilt WIFI. Our inverter of choice and a favorite with installers and clients alike. SMA Just a few years ago, SMA were asked for by everyone. Now, we all carry the brand on our price list, but not many people promote them. It’s all about Fronius now. Moving manufacturing to China really damaged the SMA brand. The major point of SMA was its German manufacturing. If you want to buy a Chinese made inverter then bring the price down to match Goodwe, Sungrow, Delta Growatt etc, but they persist with a Fronius level price. However, they did finally cotton on to the fact that Fronius had a 10 year product warranty and in late 2017 started offering that too. No LCD screen either. Pfft. The 3 phase TriPower, whilst lacking WIFI, is still made in Germany. Enphase make an excellent micro inverter, similar in function and price to SolarEdge except there is no central inverter. The conversion from DC to AC happens on the roof with each micro attached to each solar panel. Good reporting via WIFI through a small control unit (called Envoy). Zeversolar German SMA bought a struggling Chinese inverter manufacturer (Eversolar), re-engineered the product and it’s now pretty good at the lower end. It’s not an SMA inside so don’t think you are getting SMA simply because SMA own the company! Commercial solar power is one of the most efficient ways to reduce electricity costs with your organisation without impacting your day-to-day operations. More and more organisations form from almost every industry are adopting commercial solar, it is one of the fastest growing energy efficiency initiatives across the country. Solar can provide a reduction of up to 60% on electricity costs while providing additional sustainability benefits to your organisation. Our team of experts can help provide your organisation with an understanding into the benefits of solar and more importantly what it will save you in electricity costs now and for many years to come. We provide a complete end-to-end full-service approach to commercial solar including an initial no-obligation site visit and quotation. We look after the initial paperwork through to installation, new meter bookings with your electricity retailer and beyond with a range of panel cleaning and system heath checks as required– we can provide a high quality and hassle-free approach to solar for your business. Get in touch today and let us help you buy the right system for your needs and for your budget. Here are some of our most popular solar packages for your business. Install in this financial year to benefit for the governments instant asset write off applicable to all systems above! This end on 30 June 2019. Don’t miss out on instant asset write off. *Source information – ATO Website – please note: this is for information purposes only and advise should be taken from your own accountant prior to making major business purchases. Looking for Larger Commercial Solar systems – No problem simply call us! We custom design every system to ensure we supply the best solution fit for you. It means that one of our Off Grid Solar Specialists gets in touch with you for an energy audit where we ask a few questions, so we can get a good understanding of your specific needs and circumstances. Every client is different and the better we know you the better the system will serve you. After the initial assessment, our team will size and design a system that will work best for you – both now and in the future. We will take into consideration several factors e.g. your location, roof size, roof angle, orientation, battery technology, expected losses etc. Our design team will also match systems to your expected power usage, your expectations and your budget. The installation will be carried out by our local team of certified Clean Energy Council installers and electricians who will ensure the highest quality and smoothest transmission. We estimate the installation process will take (if weather allows) between 1 to 2 days depending on the size of the system. Buying an Off-Grid system can be both complex and confusing. When considering an Off-grid system as a viable option to power your home, we must assess your daily power consumption. When calculating how much power you may use in your household you must consider 5 important things and how they relate to reducing your system’s requirements, possibly saving you thousands of dollars in system costs. Energy-intensive appliances are those that heat or cool a space, be it air, water or an element. An average elecric hot water system for a 3 or 4 person house, may easily consume 4 kWh per day alone if it is powered from your Off-Grid system. Gas, Heat Pump, or Solar Hot water is a great way to simply and drastically reduce your power consumption, in-turn saving you big money. Also, remember that in bad weather you may need to boost your solar hot water system and if it has an electric boost you’ll end up using a lot of power at times when the generated power from the solar panels is drastically reduced. Choose instead gas boost. Electric cooktops and ovens are another big requirement for an off-grid system to supply. Although running ovens and elements from your off-grid system is achievable you may find going with gas will save you a lot of money. Electric Bar or electric underfloor heaters are massive power consumers and when run for long periods don’t really fit-in with an off-grid situation. Wood fire heating is an option taken up by many of our clients. The nice warm ambient temperature of a wood fire stove can also be harnessed to heat up living spaces. Basic appliances, water pressure pump,, Fridge/Freezer, washing machine, kettle/toaster, LED lights & Split A/C in the summer time. Basic appliances, water pressure pump, Fridge/Freezer, washing machine, tumble dryer, electric oven, kettle/toaster, LED lights & Split A/C in the summer time. 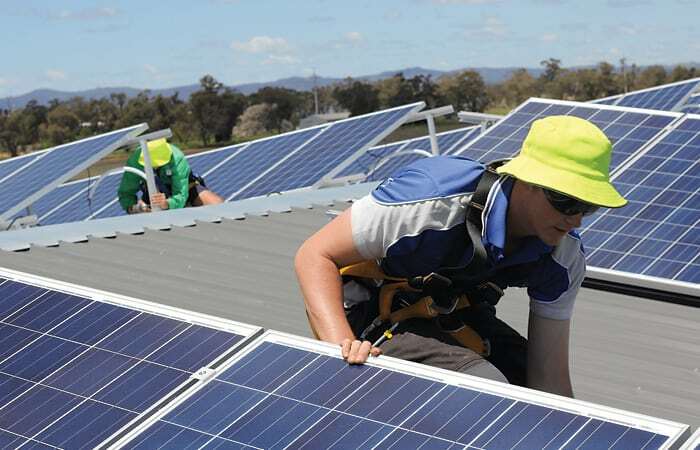 Off-grid solar systems, also known as stand-alone solar systems supply electricity to properties that are not connected to the public electricity network. During daytime, electricity is generated by the solar panels (1). 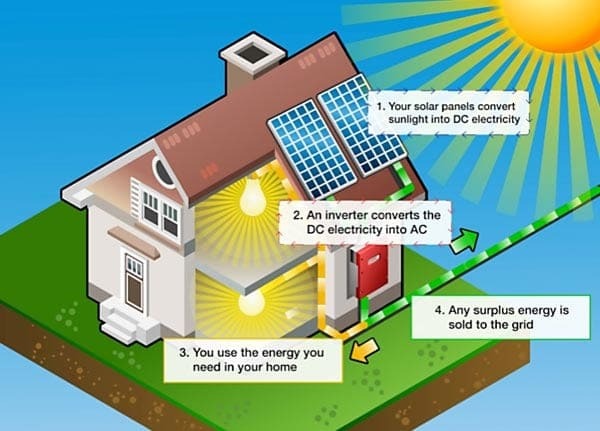 The solar PV inverter (2) converts the DC power to AC power and either directly powers your electrical loads (3) or/and charges batteries (5) via an Off-Grid inverter/ battery charger (4). During the evening or on cloudy days when the sun isn’t shining you use the power stored in the batteries “Battery Bank” (5). When the sun comes up the next day, the cycle begins again. The third available power source is a back-up generator (6) that can be integrated into the system. 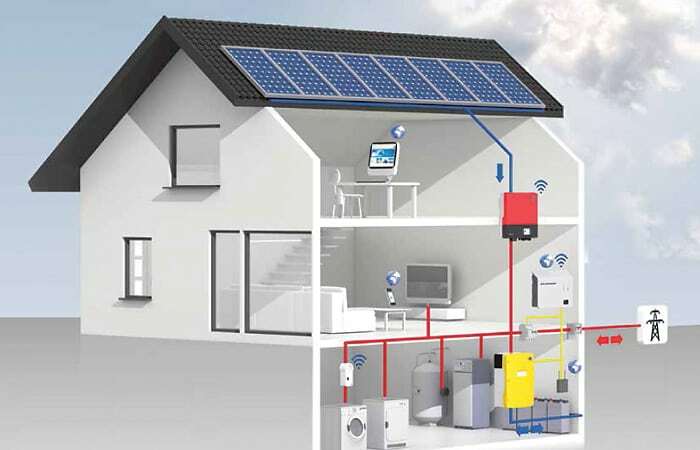 There are two different ways of configuring an Off-Grid system; these are known as AC-Coupling and DC-Coupling, each having their unique advantages. The configuration type will have an impact on the life expectancy, efficiency and flexibility of your system. The thought of cost effective battery storage is slowly becoming a reality – Advanced battery technology has arrived and with costs steadily reducing, solar power system owners can choose to take advantage of the significant financial benefits of storing their own power. Battery storage is set to transform and revolutionise the world’s electricity industry as it enables homeowners to use more, or all the electricity generated by their solar system. By storing and using your own renewable energy 24 hours a day, you could save hundreds on your regular electricity bills and protect your home from soaring power prices. Hybrid Storage Systems mean you no longer need two separate inverters for solar and storage and there are a range of installation options available for both Indoor or outside setups. All our storage systems include blackout power (ESP) as standard, allowing you to run essential loads like fridges, lights and PowerPoints whenever the grid goes down. When it comes to battery storage we know that one size does not fit all so we have a range or tried and tested options to suit. We will design and install the system that is right for you with a range of package deals available there will be a suitable option for every client. 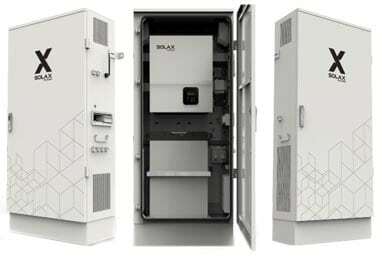 At Greenbuild we offer the highly efficient and durable SolaX Power Station Battery System. Gain more energy independence by adding a Battery Backup Solar System. A battery backup system allows you to store energy while the sun is shining, with the ability to store surplus power generated by the solar system for use at night or on cloudy days – helping reduce your energy bills even further. You also have stored power to use if the grid goes down, or at any other time you need it. 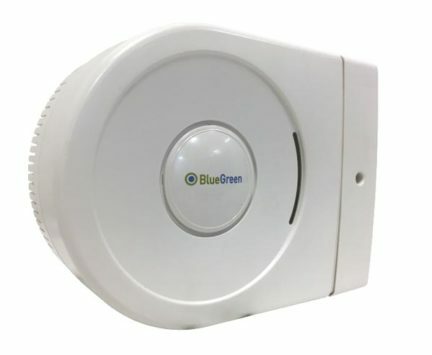 A Greenbuild solar and battery system will safely disconnect your home from the grid in the event of a power outage; your system will then switch over the power stored in the battery system providing you continuous power to your essential circuits, even in times of blackout. Making sure you can still run appliances, even if the grid goes down. Transportable – Take with you if you move to a new house. The BG5 Power Saver is easily fitted to the incoming supply of a property between the meter and the consumer unit but must be installed by a qualified electrician. Once fitted it regulates the load voltage within the property, causing appliances and lighting to consume less power. All appliances function normally when supplied from 216V to 253V and the Australian average supply is 245V. Most appliances operate more efficiently at 220V. Solar Incentives and Rebates explained - RET FIT STC! In todays market if you were to buy a solar system it is subsidised by a government scheme that is worth approximately $700 per KW Installed. That equates to an estimated saving of $3,500 off a typical 5kW system, this saving is usually applied at the point of sale – that is, your installer will use these savings to reduce the ‘up front’ cost of your solar system. There is currently a government scheme called the Renewable Energy Target (RET) Under the current legislation the solar rebate will start to reduce by one fifth every year from January 2017 until it drops to zero in 2022. Without the RET there will be no solar rebate and the price of a solar system will increase by around 40%. The dollar value of the solar rebate is changeable and goes up and down so if the demand for solar is high the rebate could plummet. The STC price is valued anywhere between $0 & $40 maximum. So if the value of the rebate is at its highest rate of $40 that equates to a rebate of approximately $700 per kw installed. If solar systems suddenly started flying off the shelves, the rebate would almost certainly drop. Going back a few year this did happen and the rebate dropped to just $17 per kw which in turn dropped the value of the STC to approximately $350 per kw installed. You install panels and inverters that are approved for use in Australia by the Clean Energy Council. So what is the financial incentive worth to me? Question – How much can I get off the price of a solar system? e.g 3kw system x $700 rebate value = $2,100 saving on the cost of the system – The bigger the system, the higher the rebate. The government introduced Renewable Energy Certificates (RECS). It mandates that the fossil fuel generators have to either build a certain amount of renewable generation in the form of wind or solar or buy the rights to other peoples renewable energy systems in the form of RECS. The STC price is a bit like a share price – it fluctuates on the open market depending on supply and demand i.e. if the industry is booming (usually just prior to the rebate being cut!) then the STC price drops and visa versa. At the time of writing this (September 2016) the STC price is around $39 per kw. Here at Greenbuild Energy Solutions we guarantee you the full value of your Financial Incentive when you sign up for a system – It is hassle free as we deal with every aspect of you purchase, Incentive, paperwork, installation and ongoing maintenance should this be required. All of our Installers are highly experienced and of course Clean Energy Council Accredited! From October 2018, South Australian residents may be eligible for the new SA Solar Battery Subsidy. This subsidy will significantly reduce your outlay for a home solar battery storage system – by up to $6,000! Whilst this scheme won’t be available until October, we are taking details now so that you can be sure to be on the list as soon as its available. We will keep you informed as the subsidy becomes live and then work with you to design the right system for your needs and budget and to meet the requirements to obtain the maximum subsidy. Subsidy of up to $6000 dollars per household are available plus a loan option to purchase solar panels. Whilst final details are yet to be released, here is how we anticipate the process to go. Our job is to simplify the process of getting your subsidy and/or loan for the brand-new government solar and/or battery subsidy. Fill in the form to register your interest in the SA Home Battery Scheme or contact us for information. We will give you a call to discuss your needs and help you gain access to the generous battery rebate that will greatly reduce your electricity costs. We will let you know how much you qualify for and design the right system for your needs and budget. Simply accept the quote, decide what financing option you would like to access, and we’ll arrange the install. Fill out our Contact Form below and we will be in touch with you as the scheme rolls out. 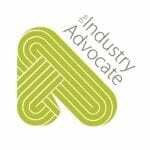 Greenbuild SA supports the Industry Advocate’s SA Product Register initiative and provides a range of design, supply and installation services every week at our office in Burnside SA. Our services are provided to suburban and regional areas within South Australia. Greenbuild SA has extensive experience with domestic and commercial solar applications. Our expertise in off-grid and battery integrations has provided regional customers with access to cost effective renewable energy. Provide us with a few details about what you’re interested in and we’ll contact you to arrange a suitable day and time to visit you.